Author: Veith, Gene Edward Jr. 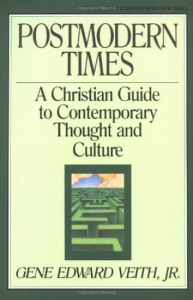 The greatest value of the book is that it puts into words what most believers have observed but have not connected to a philosophy of our culture. It helps tie together style, literature, media, music, education and politics that seem to have no unifying theme. It also presents many helpful ideas for about how to minister to this new generation.